New for 2016, Climate FieldView Plus™ allows you to collect and visualize your data all in one place with the Climate FieldView Cab app, helping you increase knowledge of your fields and enabling informed decision making all season long. We’ve been working hard on some new updates to the Climate FieldView Cab iPad® app, and we’re excited to announce that FieldView Cab 5.0 is currently available and can be downloaded in the App Store. What is Climate FieldView Cab? 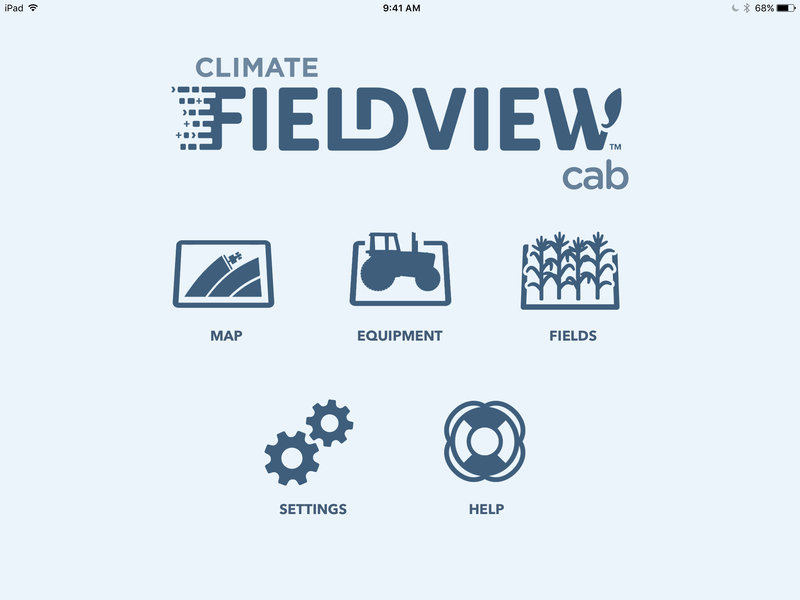 Climate FieldView Cab for iPad® enables growers to collect, understand and store all their field data in one place. It combines the best in real-time cab monitoring and visualization, with simple field data analysis tools in a simple mobile app. The Cab app requires enabling technology of Precision Planting’s 20/20 SeedSenseTM, or a simple, easy-to-use hardware solution: the Climate FieldView DriveTM. The Cab app connects to the Climate FieldView Drive via Bluetooth or 20/20 Seedsense via USB Cable to display real-time maps of your planter’s performance or high definition yield maps during harvest. In addition, you can import shapefile maps so that any planting, harvest, or imported map can be viewed side by side so you can make more informed decisions in the field. 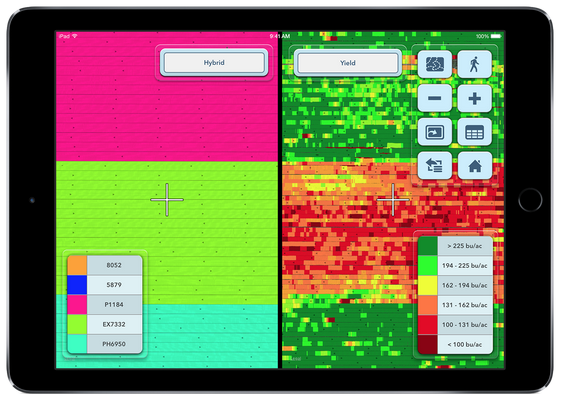 When not in the planter or combine, field maps are stored on the iPad® to enable informed field scouting. Whether at home, the office, or in the field, your maps are in a single, easy-to-browse mobile tool. Climate FieldView Cab 5.0 makes managing hybrids, prescriptions, and imported maps even easier. Additionally, it adds support for the newly released Climate FieldView DriveTM which streams real-time planting and harvest data wirelessly to the iPad® while in the field. The Climate FieldView Drive installs easily by simply plugging into the CAN port of your tractor or combine and then pairing it with the Cab app over Bluetooth. Hybrid entry has been improved allowing you to enter in the hybrids you plan to plant before heading out to the field. This allows you to take care of hybrid entry ahead of time rather than entering hybrid names on a keyboard while in the middle of planting. Assign particular hybrids to specific fields or enter all the hybrids purchased for the season. Avoiding error prone hybrid entry in the field ensures the accuracy of your hybrid maps for scouting and hybrid yield performance reports. Creating or uploading seeding prescriptions and having them transfer to the Cab app is now easier. Create your prescriptions using the Script Creator tool in Climate FieldView Pro™ and export it directly to the Cab app. It will then be be synced to the iPad® and assigned to the correct field, or you may import your prescriptions manually at fieldviewplus.com. The prescription will then be ready to execute when it’s time to plant. 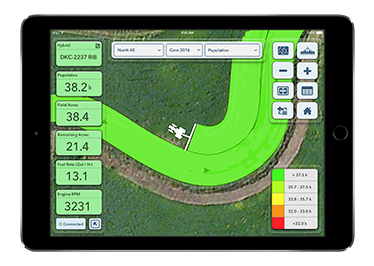 Other notable additions are Planter Elevation, Combine Elevation and Insecticide maps, improved Field Boundary Detection, and optimization for the iPad Pro™. The FieldView Cab app is available to download in the Apple iOS App Store for iPad®. Make sure you’ve purchased your Climate FieldView Drive to connect with the Cab app this upcoming season. Limited quantities are still available.